Burj Alhind at Calicut - A towering tribute to high end urban living, the tallest building in Kerala with 40 storeys. 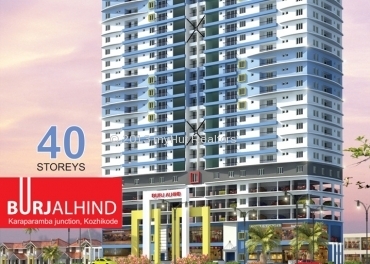 Burj Alhind, the skyscraper residential apartments in Kerala, is abutting state highway at Karaparamba junction, one of the most premium developed residential destination within Kozhikode. The location is highly envious with proximity to all living & functional requirements at a stone’s throw away. Burj Alhind houses high end residential apartments with world class features along with office space, retail outlets and shopping area.Envisioned by renowned architects and executed by experienced engineers of the world’s highest high rise Burj Khaleefa of Dubai, Burj Alhind sets a new standard for skyscraping lifestyle in Kozhikode.